With world-class engineering, exceptional performance, and advanced safety systems, the all-new Kia Optima gives you many good reasons to be passionate about driving a midsize sedan. It combines a powerful and fuel efficient engine with technologically advanced available features making driving more convenient than ever. Like all Kia models, every Optima comes with an industry-leading, 10-year/100,000-mile warranty program, a reflection of its outstanding quality and reliability. Excitement comes standard with your new Kia Optima. The key to its exciting performance is a 192-horsepower, 2.4L engine. Or you may choose Optima SX Turbo or Optima Limited, which are both equipped with a turbocharged, 274 horsepower 2.0L engine. For an exhilarating green driving experience the Optima also has a hybrid model that enhances your fuel efficiency while delivering exceptional performance. Smooth handling and incredible power come standard with all models of the Optima. Optima’s technologically advanced features are designed to make every drive more convenient. Bluetooth wireless technology puts streaming audio at your command when using a compatible Bluetooth wireless technology-enabled device. Available features include convenient voice-command navigation with SiriusXM Traffic, an Infinity audio system with excellent audio performance, and a Supervision meter cluster with a Thin-Film Transistor (TFT) color LCD that’s exceptionally easy to read. The Optima is available with the innovative UVO eServices Infotainment System with voice-command navigation. UVO eServices lets you stream music, download apps from the App Download Center, monitor your vehicle's driving habits, access 911 Connect or Enhanced Roadside Assist, and check maintenance requirements with Vehicle Diagnostics on the large 8"-capacitive touch screen. Additionally, there are no subscription fees to enjoy all these benefits. The Optima’s safety systems help add peace of mind in certain situations. That’s why all Optima models are equipped with advanced safety systems engineered to help you maintain control, even in challenging road conditions and in some emergency situations. They function automatically, leaving you free to focus on the road. 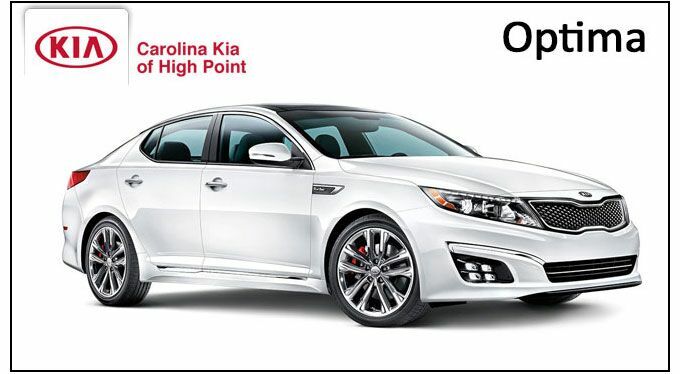 To learn more about the new Kia Optima High Point NC shoppers should visit, or call us at (888) 980-9494. You can also browse the amazing selection of new and pre-owned Kia models online any time. With the largest selection of new and pre-owned Kias at everyday low prices Carolina Kia is the place to shop for your new Optima. We pride ourselves on customer satisfaction and service and have earned multiple Presidents’ Awards for customer service and satisfaction. We love our customers and our community and devote ourselves to giving back to both. We have incredible member benefits including complimentary oil and filter changes, tire rotations, car wash with every service, discounted accessories, seasonal multi-point inspections, loyalty reward points, courtesy shuttle, and more! Visit Carolina Kia today.